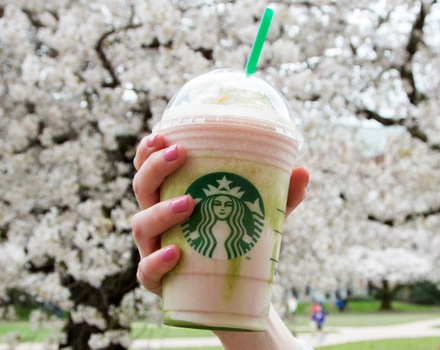 The first day of spring is Sunday, March 20th, and to celebrate the changing of the seasons, Starbucks is putting out a new specialty Frappuccino: the Cherry Blossom Frappuccino. The drink is inspired by Japanese cherry blossoms, which burst open at the beginning of spring every year. The frappuccino starts with a blend of strawberries and cream with white chocolate sauce. A matcha drizzle is swirled in to evoke the colors of cherry blossom trees, then the drink is topped with whipped cream and a matcha sprinkle. It’s colorful and you’ll feel ready for the change in seasons just looking at at! A version of this drink has been available at Starbucks stores in Japan for the past 6 years now. The Sakura Blossom (Cherry Blossom) & Strawberry Frappuccino is also available as a hot latte there, so if you’re planning a trip to see one of the many cherry blossom festivals in Japan, be sure to pick one up and see how it compares to th US version. The US limited edition will be available from March 15-March 20th.